and as edging on the butterfly sleeves. 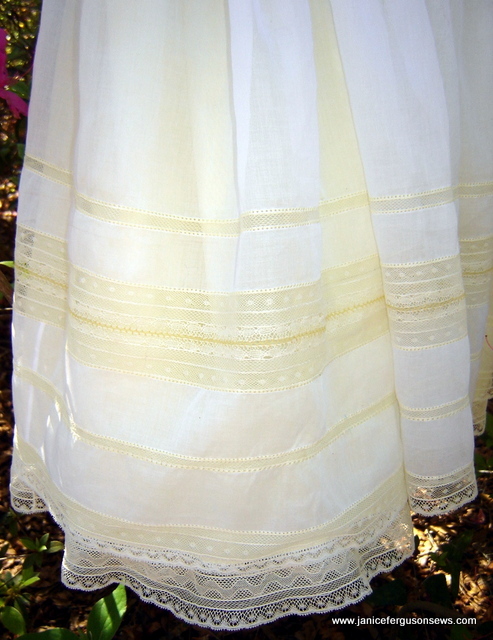 On Chery Williams Wedding Ring Dress, a galloon was used for the edging on the sleeves, collar, and at the hem. Of course, there was no gathering thread, so I first rolled and whipped one side over a white machine quilting thread. It worked just fine. And one more thing…..On a few occasions, I have split a wide galloon into two edgings. By rolling and whipping over a heavy thread, quilting or 30/2 cotton, you can turn that galloon into twice as much serviceable yardage. 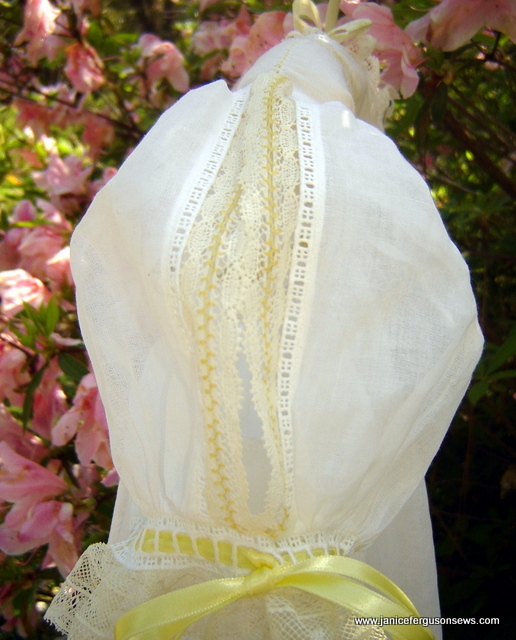 Galloons are most often used for straps on nightgowns or sundresses. Until I had a need to use them for other purposes, it hadn’t occurred to me that they were so versatile. The next time you see a galloon, I hope you will think about the options it might offer. This is my post for White Wednesday. Check out the pretties there. 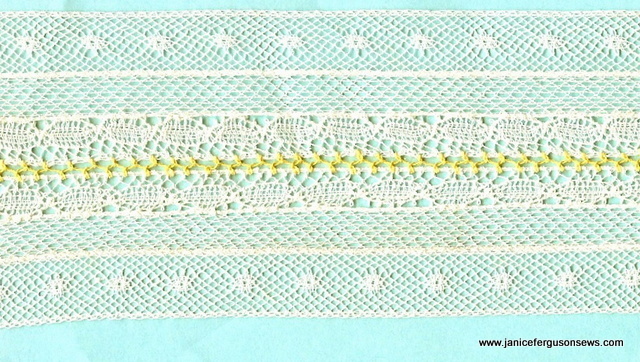 This entry was posted in antique textiles, antique/vintage textiles, heirloom sewing, techniques, Tutorials and tagged fancybands, heirloom sewing, lace galloon, uses for lace galloons, using galloons. Bookmark the permalink. As usual, you have given us great information along with gorgeous examples! 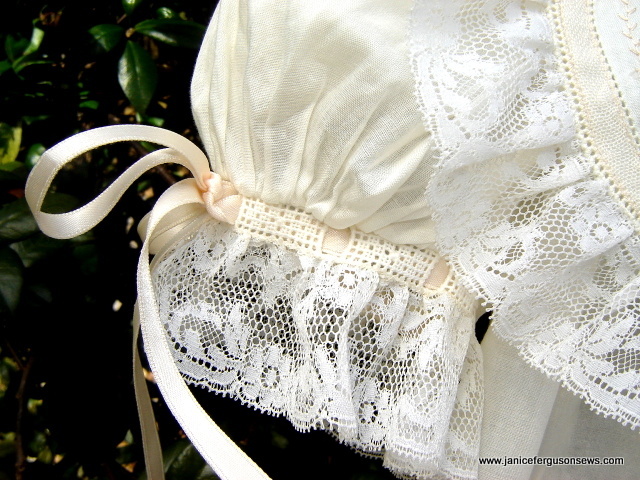 I have an old piece of light pink galloon cotton lace and I’ve never known what to do with it. I’ll have to dig it out and think about the options! Great! I look forward to seeing what you do with it, Lisa. Hey Friend! When you fa–ot (I can’t use that word anymore or this might go to spam…) I assume you machine stitch this, what thread, needle and stitch do you use? Do you use a stabilizer? I love the yellow lace joining stitch and look! I did nothing, Terri. I bought this galloon as is, on a bolt, from a little old lady who claimed to have an attic full of beautiful laces. Suzanne and I met her twice at an antique mall where she had a booth and bought several vintage notions, books and laces, including a few hanks of coronation cord. That’s where I got my copy of The Mary Frances Sewing Book. She would not let us come to her home to see the lace because she said her house was too messy. No doubt, the lace was rotting in that Florida attic as we chatted with her! She did not show up for our third appointment and a short while later, her things were removed from the mall. I think she passed away.